Marjorie Thelma Haines Gardiner was born on 1 February 1908 in Wokurna, South Australia , daughter of Edward Gardiner and Alice Maria Haines. She died in 1979, aged 70 years. Miriam Shearer was born on 21 December 1900 in Mundoora, South Australia , daughter of William John Shearer and Fanny Louise Haines. On 10 March 1925, Miriam, aged 24, married Frederick Joseph Adams, aged 28, son of Richard James Adams and Emily Louisa Loveridge, in Methodist Church in Mundoora, South Australia . Gwendoline Bessie Shearer was born on 17 November 1901 in Mundoora, South Australia , daughter of William John Shearer and Fanny Louise Haines. Gwendoline was buried in the Dudley Park Cemetery, Dudley Park, South Australia . Violet Shearer was born on 27 September 1902 in Mundoora, South Australia , daughter of William John Shearer and Fanny Louise Haines. William Ralph Shearer was born on 21 June 1903 in Mundoora, South Australia , son of William John Shearer and Fanny Louise Haines. 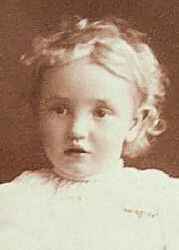 Ella Doreen Shearer was born on 7 November 1904 in Mundoora, South Australia , daughter of William John Shearer and Fanny Louise Haines. George Pottinger Shearer was born on 6 July 1906 in Mundoora, South Australia , son of William John Shearer and Fanny Louise Haines. On 11 April 1932, George, aged 25, married Phyllis May Walker, aged 19, daughter of Alexander Anderson Walker and Edith May Lewis, in Methodist Church, Pirie Street in Adelaide, South Australia . Reta Isabel Haines was born on 19 November 1905 in Port Pirie, South Australia , daughter of Thomas David Haines and Ellen Ann Blight. Frank Longbottom was born on 8 April 1877 in Belalie, South Australia , son of David Longbottom and Marey Coope.